Hwa Chong Institution (HCI) has done it again. On 4 March 2016, the day of the ‘A’ Level Results Release, the school revealed the wondrous achievements of HCI’s Class of 2015. This was a cohort that had achieved the best GCE ‘A’ Level results since the first batch of Integrated Programme students took their ‘A’ Level examinations in 2007. Six out of 10 scored three H2 distinctions and above! The sense of achievement was certainly palpable in the school hall. The BrightSparks team met with bright smiles and soaring fists, and in the midst of the crowd’s chatter we could hear words of congratulations exchanged among friends. But the highlight of our experience was not the positive energy bouncing off all who were present – it was the opportunity to speak to two brilliant graduates who have done exceedingly well. They were Zane Chee Yong Wei and Wang Peixuan. 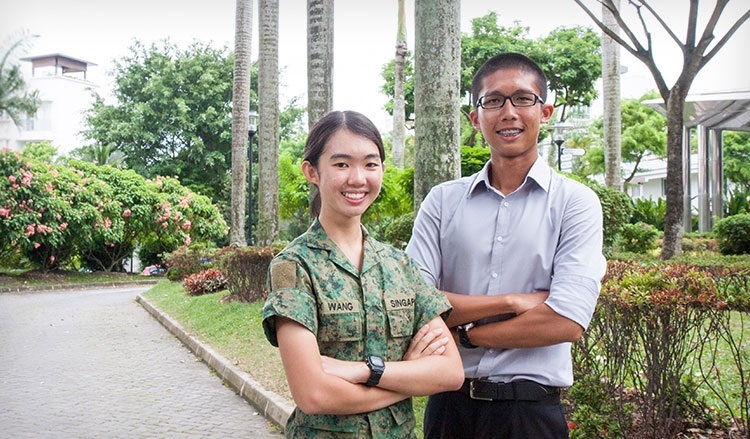 Both straight A’s students, Zane and Peixuan have been awarded the Singapore Armed Forces (SAF) Scholarship conferred by the Public Service Commission (PSC)and the SAF Merit Scholarship respectively. Zane has plans to read Philosophy, Politics and Economics in a reputable UK university, and is currently deciding between University College London, Warwick, York and Durham to spend his undergraduate years in. On the other hand, Peixuan has received a conditional offer to read Law at the London School of Economics and Political Science (LSE), but is still keeping her options open – she is also considering universities in the US, some of which include Harvard, Yale, and Stanford. Do you have a passion to serve? Take the first step by applying for a scholarship on BrightSparks!